칸쿤, 멕시코의 호스텔 카베 칸쿤 | 호스텔월드에서 예약하세요. Join the tribe & meet the family upon checkin to go out & enjoy Cancun’s best Downtown location together, along with all the adventures, beaches, tacos, and parties on offer. As amazing as this sounds, don’t forget to take it easy & enjoy our signature slow-travel style: Grab a hammock, a beer & some Z’s. You’re on vacay. What’s the rush? With TEN years of experience in Cancun, our priority is making sure you have a safe place to land, where you feel welcomed, comfortable, and at home. 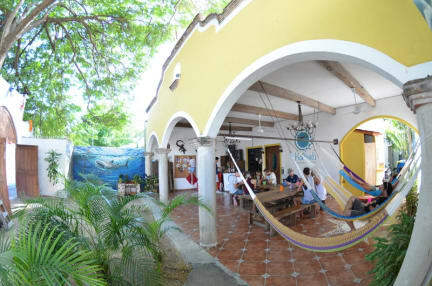 __Our Hostel is changing traveler’s views of Cancun, one person at a time; by day, the Hostel maintains a relaxing atmosphere: the kind that helps you plan for a long day exploring Mayan ruins or the environment where you can feel comfortable kicking back in our incredible hammocks, doing absolutely nothing without a drop of guilt. Every evening, our courtyard plays host to our famously social vibe, helping you meet your future travel buddy, or getting to know your next dance partner. No matter the time of year, who your room-mates are, or where they’re from: the one guarantee is that memories will be made here, and you can be sure they’re going to be some of the best on your trip! The Hostel buildings themselves were designed in the Mexican 'Hacienda' architectural style. The buildings have beautiful details like a beautiful facade with huge wooden doors, gardens, art, and amazing tile work. Our bathrooms are NOT stalls, but real, home sized bathrooms. - 30 seconds from Central Downtown Cancun, for real, safe, tasty Mexican meals under $3 USD! - 30 seconds from the square’s busy cultural activities every Thursday through Sunday! - Multilingual: English, Spanish, French, and more! - Dedicated to help you have a great time! - A Backpacker’s dream: slow travel, fellow solo travelers, & real experiences! - Air-conditioned rooms and dorms 24/7!! - Cable TV + AppleTV + Netflix + Projectors for the lazy days, rainy days, or the hangovers! - Full Breakfast prepared by our in-house chefs! - Free Dinner prepared by our in-house chefs! - Free Coffee + Tea + Drinking-water: all day! - Book + Coin Exchange: Take and leave what ever you want! - Snorkel a reef with the Jungle Tour, where you drive a boat that feels like you're playing Mario Kart in real life! Inquire about pricing and schedules at the front desk! Here you can enjoy and relax at the same time. Really nice place!!! 가격 정말 싸고 직원들이 친절했습니다. 쉽이인쉬뤼라꾜혰는뗴 욜눼묭이써 쟈쒀효. 쌰우워활떄 댜뜻햔 무뤼 좔안놔오욨. 제가 썼던 방은 사람이 많았지만 서로 다 조심하는 분위기여서 좋았습니다. 위치도 정말 편했고(바로앞에 광장있고 걸어서 10분거리 시외버스터미널, 시내버스정류장), 여행동안 짐도 맡아주셨습니다. 가성비 좋아요. It has nice vibe and serves a group of hammocks for chilling. It has small but well-equipped kitchen. The staff is really sociable and open-mind.